Recent 230Th dating of fossil corals in west Luzon has provided new insights on the emergence of late Quaternary marine terraces that fringe west Luzon Island facing the Manila Trench. Apart from regional sea level changes, accumulated uplift from aseismic and seismic processes may have influenced the emergence of sea level indicators such as coral terraces and notches. 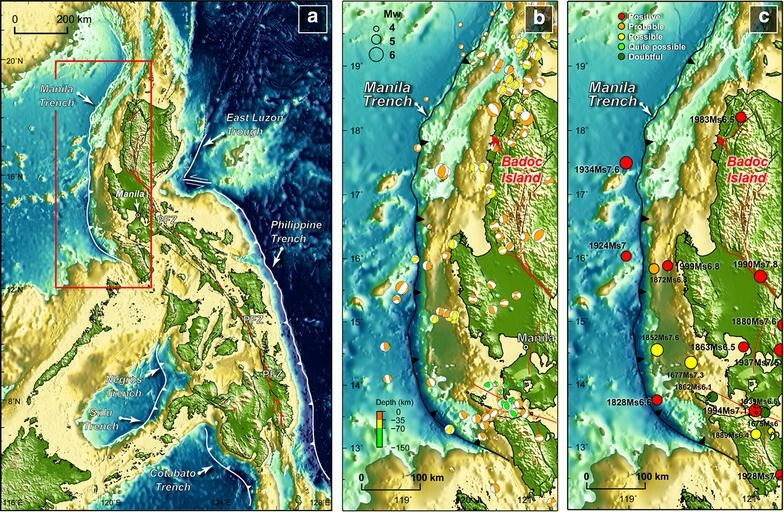 Varied elevations of middle-to-late Holocene coral terraces along the west Luzon coasts reveal the differential uplift that is probably associated with the movement of local onland faults or upper-plate structures across the Manila Trench forearc basin. In Badoc Island, offshore west of Luzon mainland, we found notably young fossil corals, dated at 945.1 ± 4.6 years BP and 903.1 ± 3.9 years BP, on top of a ~5-m-high reef platform. To constrain the mechanism of emergence or emplacement of these fossil corals, we use field geomorphic data and wave inundation models to constrain an extreme wave event that affected west Luzon about 1000 years ago. Our preliminary tectonic and tsunami models show that a megathrust rupture will likely lead to subsidence of a large part of the west Luzon coast, while permanent coastal uplift is attributed to an offshore upper-plate rupture in the northern Manila Trench forearc region. The modeled source fault ruptures and tsunami lead to a maximum wave height of more than 3 m and inundation distance as far as 2 km along the coasts of western and northern Luzon. While emplacement of coral boulders by an unusually strong typhoon is also likely, modeled storm surge heights along west Luzon do not exceed 2 m even with Typhoon Haiyan characteristics. Whether tsunami or unusually strong typhoon, the occurrence of a prehistoric extreme wave event in west Luzon remains an important issue in future studies of coastal hazards in the South China Sea region. Coastal zones are among the most vulnerable in the world because of their exposure to sea level fluctuations brought about by climate conditions, tropical cyclones, and tectonic processes. The Asia-Pacific region, in particular, is constantly affected by extremely strong waves brought about by tsunamis (e.g., 2011 Tohoku-oki earthquake in Japan) and super typhoons (e.g., 2013 Typhoon Haiyan in the Philippines) [e.g., (Terry and Goff 2012)]. Of particular interest in the Southeast Asian region is the tsunami-generation potential of the Manila Trench which poses risks to coastal zones across the South China Sea (SCS). Over the years, the tsunami-generation potential of the Manila Trench has been highlighted in the tsunami hazard assessments of Taiwan, Thailand, China, Vietnam, Malaysia, Singapore, and Philippines [e.g., (Dao et al. 2009; Huang et al. 2009; Liu et al. 2009; Megawati et al. 2009; Ruangrassamee and Saelem 2009; Wu and Huang 2009; Nguyen et al. 2014; Li et al. 2016)]. In the Philippines, recent efforts in tsunami studies involve characterization of source faults through validation of historical and modern tsunami observations [e.g., (Bautista et al. 2012; Salcedo 2014)]. Mapping and radiometric dating of emergent coral terraces and coral microatolls are also being done to understand the active tectonics of the Manila Trench and its associated upper-plate tectonic structures [e.g., (Ramos and Tsutsumi 2010; Abigania 2011)]. We found ~1000-year-old coral debris on an island, approximately 120 km offshore west Luzon mainland, to be particularly interesting because of their implications for regional coastal hazards at the millennial scale. In the west Pacific, transported reef-platform coral boulders offer important insights into the occurrence of extreme wave events such as tsunamis or strong typhoons [e.g., (Yu et al. 2004; Goto et al. 2010; Terry and Etienne 2014; May et al. 2015)]. In this study, we use emergent coral terraces, fossil coral data (e.g., elevation, 230Th age), and numerical modeling to constrain a prehistoric extreme wave event along the northern Manila Trench forearc region about 1000 years ago that could potentially be larger than those recorded in the almost 400-year-long written history of the Philippines. The oppositely dipping subduction zones in the Philippines are among the least-studied and least-constrained active megathrust zones in Southeast Asia. The east-dipping discontinuous Manila–Negros–Sulu–Cotabato Trench system and the west-dipping Philippine Trench system are potential sources of large magnitude offshore earthquakes which pose imminent threats to lives and properties along coastal communities (Li et al. 2016; Ramos and Tsutsumi 2010; Besana et al. 2004; Fig. 1). Of the trench systems in the archipelago, the Manila Trench has received much attention due to its seismic potential and the tsunami hazard it poses to coastal megacities surrounding the South China Sea. In the last 400 years of historical records and instrumental seismicity in the Philippines, the largest earthquakes that are possibly associated with the Manila Trench occurred in 1852 (Ms7.6) and 1934 (Ms7.6) (Bautista et al. 2012) (Fig. 1c). As the archipelago is lined with thousands of kilometers of coastline, the impacts of coastal flooding brought about by extreme wave events remain one of the biggest concerns during this time of increasing surface temperatures and sea level [e.g., (Intergovernmental Panel on Climate Change (IPCC) 2013; Villarin et al. 2016)]. Aside from the threat of tsunamis, coastal communities around the SCS region are also at risk from the impacts of extreme weather events such as storm surges. Coastal geomorphic features such as coral-reef platforms and solution notches provide us opportunities not only to better understand the mechanisms and processes of coastal hazards but also to prepare for their impacts. Prior to surveys, aerial photographs and satellite imageries were studied to identify coasts with well-preserved geomorphic features. Aerial photographs of 1:16,000-scale and 5-m Interferometric Synthetic Aperture Radar (IFSAR)-derived topographic data were sourced from the National Mapping and Resource Information Authority (NAMRIA) in the Philippines. We also used Google Earth images to delineate the boundaries of local geomorphic units. Fossil corals, presumably fresh and pristine, were then collected from emergent platforms whenever available. Topographic profiles of emerged coastal features were generated using a TruPulse 360 R rangefinder and a tripod. We measured the elevation of the paleoshoreline angle and/or inner edge of coral platforms from the tide level at the time of survey, then corrected for mean sea level at the nearest tide gauge station (i.e., Currimao). We use ‘inner edge’ when the shoreline angle (i.e., junction between the cliff and abrasion platform) is obscured by overlying colluvium or beach deposits [e.g., (Jara-Muñoz et al. 2015)]. The elevations of terrace surfaces and their associated inner edge, or shoreline angle when observed, are reported in meters above mean sea level (m amsl). Mean sea level along the northwestern coasts of Luzon Island ranges from 0.24 to 0.33 m as recorded in two tide gauge stations (Currimao and San Fernando), while tidal range is 0.54 to 0.68 m (National Mapping and Resource Information Authority (NAMRIA) 2016). Five fossil coral samples from one survey site in northern Badoc Island were analyzed for 230Th dating (Shen et al. 2012). U-Th isotopic compositions of the selected chipped subsamples, which were gently crushed and physically cleaned with ultrasonic methods (Shen et al. 2008), were determined on a multicollector inductively coupled plasma mass spectrometer (MC-ICP-MS), Thermo Fisher Neptune (Shen et al. 2012). Recent data on half-lives of U-Th nuclides were used to calculate the 230Th ages of the samples (Shen et al. 2012). Uncertainties in the U-Th isotopic data and 230Th dates relative to 1950 AD (years BP) are given at the two-sigma (2σ) level or two standard deviations of the mean (2σm) unless otherwise noted. U-Th chemistry (Shen et al. 2003) and instrumental analysis (Shen et al. 2012) were conducted at the High-Precision Mass Spectrometry and Environment Change Laboratory (HISPEC), National Taiwan University. The analyzed U-Th isotopic compositions and contents of the samples presented here are given in Table 1. The absence of secondary carbonates in the intraskeletal structure, the 238U levels of 2.3–3.4 ppm, and the initial δ234U values of 143.8-148.1‰ as in modern corals and seawater (Shen et al. 2008) suggest that the selected coral samples are well preserved. 230Th ages of fossil corals range from 6871.7 ± 22 years BP to 903.2 ± 3.9 years BP and possibly represent the timing of emergence of reef platforms brought about by global mean sea level changes and tectonic processes from middle to late Holocene. The geometric characteristics of modeled fault ruptures along the northern Manila Trench forearc region were assumed from seismicity patterns, earthquake focal mechanisms, geophysical data, and coseismic deformation inferred from uplifted coral terraces [e.g., (Ramos and Tsutsumi 2010; Hayes and Lewis 1984)]. Source fault parameters and resulting surface deformation were then established using scaling relations for subduction zone earthquakes, upper-plate faults, and elastic dislocation models (Okada 1985; Murotani et al. 2013; Wells and Coppersmith 1994) (Table 2), while also considering the effect of bathymetry and horizontal displacement (Tanioka 1996). Tsunami modeling was performed using JAGURS, a numerical code that computes tsunami propagation and inundation on the basis of the long waves or the dispersive waves (Boussinesq-type) [e.g., (Satake 2002; Saito et al. 2010; Baba et al. 2015)]. For near-field tsunamis, the code takes into account the effects of horizontal displacement and seafloor slope [e.g., (Tanioka 1996)]. These are solved on a finite difference scheme using a staggered grid and the leapfrog method [e.g., (Jakeman et al. 2010; Baba et al. 2014; Baba et al. 2015)]. We then assume tectonic deformation and tsunami inundation based on geomorphic data available. The tsunami simulation in west Luzon utilized the global 1 arc-min bathymetric grid of Sandwell and Smith (1997) and 1 arc-second topographic grid derived from the Shuttle Radar Topography Mission (SRTM). Badoc Island is a small coral island located approximately 1 km off the coasts of west Luzon and approximately 130 km east of the Manila Trench. The coral island is characterized by emergent reef platforms and surrounded by modern fringing reefs. Coral boulders and pedestals resting on the emergent and modern reefs are also dominant along the west coast of the island (Fig. 2). The topmost, cliff-forming reefs that are soil-mantled with elevations ranging from 20 to 28 m are inferred to be of Late Pleistocene age based on the broad, flat morphology resembling an extensive carbonate platform. The Late Pleistocene terrace (LPT) surface is characterized by a thick soil cover with evident landslide scarps, dense grass vegetation, and sporadic occurrence of highly weathered coral heads (Fig. 2a). At the western side of the island facing the South China Sea, the LPT cliff rises up to 28 m amsl, while at the eastern coast, the LPT margin exhibits a broad gently sloping surface that rises from 7 to 20 m amsl. The Holocene terraces are marked by low-lying (i.e., 2–7 m amsl) sequences of coral reef terraces that are variably preserved and exposed around Badoc Island. We observed up to possibly four Holocene terrace steps with the highest terrace rising up to about 7 m amsl. Along the west coast, coral terraces generally expose rocky and abrasional platforms, while terraces along the northeast and east coasts are often covered with sand and coral debris (e.g., shingle, boulders, broken fragments). The number of terraces as well as the terrace elevations varies around the island. Along the east coast, two to four Holocene terrace steps are observed with Terrace 1 (T1) being the lowest terrace at 1.9–3.7 m amsl, Terrace 2 (T2) at 3–3.8 m amsl, Terrace 3 (T3) at 5.3 m amsl, and Terrace 4 (T4) as the highest terrace rising up to ~7 m amsl. Along the western coast, one to three Holocene terrace steps are observed with T1 measured to be at 2.3–3.4 m amsl, T2 at 3.1–3.8 m amsl, and T3 at 4.6 m amsl; a wave-cut notch was also observed at 5.4 m amsl. New 230Th ages of fossil corals sampled on top of the terrace surfaces reveal episodes of emergence or relative sea level (RSL) fall during middle to late Holocene. Holocene coral platforms on the northern coasts are generally well preserved with intact fossil corals but their paleoshoreline angle is often obscured by erosion, collapse, or sand deposits. Based on the varied heights of Holocene terraces around the island, tilting to the southeast is suggested (Fig. 2a). Limestone beds and coral debris that comprise the LPT were also noted to be southeast dipping. Unusual terrace chronology was revealed from fossil coral ages at one survey site in northern Badoc Island, where possibly three terrace steps were recognized: T1 at 2.7 m amsl, T2 at 3.7 m amsl, and T3 at 4.9 m amsl (Fig. 2). The lowest terrace (T1) surface is an abrasional platform exposing massive and eroded corals, and cemented coral rubble. We interpret T1 to be an erosional surface of the mid-Holocene sea level highstand based on the age (6872 ± 22 years BP) of the coral sampled. Meanwhile, a younger (2727 ± 13 years BP) fossil coral was sampled from the terrace riser slope above T2. Unlike T1 which exposes the rocky carbonate platform, the T2 surface is buried by coral boulders and sand. Terrace 3 (T3) is characterized by an almost 60-m-wide sub-horizontal surface that is buried by sand, shells and shell fragments, and coral boulders (Fig. 3). Coral boulders are generally distributed just above T2 and the sloping riser separating T2 and T3; individual corals are mostly cm-sized, while a few isolated large blocks are almost a meter wide. The largest coral boulders are often cemented fragments of branching corals (possibly Acropora) that similarly comprise the lowest erosional terrace, hence they are assumed as transported blocks from the reef crest. T3 is particularly interesting because notably young (945.1 ± 4.6 years BP and 903.1 ± 3.9 years BP) fossil corals lie within the coral boulder field (Fig. 3; Table 3). The young fossil corals, which appear to be encrusting forms, are approximately 20–30 cm in diameter and 2–5 cm-thick. Although preserved in their upright position, the occurrence of encrusting corals with variably sized overturned boulders of massive corals and cemented coral rubble imply that they are probably allochthonous. The foraminifera-rich coarse sand cover that occurs with the coral debris and buries the upper terraces also implies high-energy deposition [e.g., (Switzer et al. 2010)]. Typically, the age of corals attached on terrace surfaces will have a ‘younging’ trend as terraces become closer to the present sea level, indicating the most recent episode of emergence. In northern Badoc Island, the apparent ‘age inversion’ or ‘younging’ of ages with increasing terrace elevation poses complexities in interpreting the coastal tectonics of the island. From field observations, geomorphic analysis, and geochronologic data, the formation of Holocene coral terraces, RSL changes, and occurrence of a potentially extreme wave event in the last millennium are hypothesized. Between 7 and 6 ka ago, the mid-Holocene sea level highstand eroded the Holocene transgressive reef forming an erosional platform (T1) that is well preserved around Badoc Island; consequent emergence of the land or episodes of RSL fall then exposed the mid-Holocene corals. If the late Holocene (2727 ± 13 years BP) coral is attached or encrusted, emergence or uplift of the reef platform is inferred in which coseismic uplift of 4–5 m (i.e., to raise the terrace to its present position) must accompany the rupture of an offshore reverse fault. We further hypothesize that the apparent ‘younging’ of coral ages toward the upper terrace surfaces may imply a cycle of interseismic subsidence and coseismic uplift; however, such interpretation may only be tested when information from GPS and microatoll studies become available for coastal regions facing the Manila Trench. We also postulate two possible scenarios of marine inundation to account for the occurrence of ~1000-year-old coral boulders on the upper terrace steps. Meter-scale coseismic uplift resulting from a significantly large offshore earthquake may have occurred in the last millennium and generated a tsunami that emplaced the coral boulders on the uplifted reef. The extreme wave scenario would seem more plausible as another fossil coral in cemented coral rubble from the mainland coast (about 1.5 km east of Badoc Island) yielded an age of 1,320 ± 5 years BP. The variable elevation of the ~1000-year-old corals from mainland Badoc (~2 m amsl) and Badoc Island (5 m amsl) implies that an overwash event would more likely account for the spatiotemporal distribution of the coral boulders, rather than differential uplift of the mainland coast and the island. If the young corals are assumed to be in situ, an almost 5-m-high coseismic uplift would require a large amount of slip and surface rupture area from either the Manila Trench megathrust- or nearby upper-plate fault. As the Philippines is also predisposed to extreme tropical cyclones, an alternative scenario entails emplacement of the coral boulders onto the terrace surface by an unusually strong typhoon. A recent catalog of tsunamis and seiches in the Philippines provides a summary and review of earthquake and tsunami reports derived from historical records, previous catalogs, and recent earthquake reports (Bautista et al. 2012). From 1589 to 2012, Bautista et al. (2012) list at least 11 tsunamigenic earthquakes which may have affected west Luzon in which some events may have originated from the Manila Trench. Of the 11 earthquake events, 5 were rated as having a positive certainty of tsunami occurrence (100%), while the other events have probable (75%), possible (50%), or doubtful (<25%) tsunami certainty (Fig. 1c; Table 4). These ratings were based on eyewitness accounts and quality of information (i.e., specific places affected, clear tsunami description). Historical tsunami data from the past decades to a few hundreds of years ago further reveal that wave inundation reached a maximum height of 2 m along the coasts of northwestern Luzon (Bautista et al. 2012). The Philippines is also frequented by tropical cyclones (TC) which enter the country at an average of 19–20 TCs per year (Philippine Atmospheric, Geophysical and Astronomical Services Administration (PAGASA) 2008). While the 2013 Typhoon (TY) Haiyan (local name: Super Typhoon Yolanda) remains to be the deadliest typhoon in modern meteorologic records to hit the country, the 1881 Haiphong typhoon that devastated Vietnam is also reported to have severely damaged the Philippines leaving thousands of casualties [e.g., (Ribera et al. 2008; Terry et al. 2012); Table 4]. As the strongest landfalling tropical cyclone, TY Haiyan generated a surge of 5–6 m (Tajima et al. 2014) and run-up as high as 15 m (Kennedy et al. 2017). In a recent assessment of storm surge vulnerable areas in the Philippines, storm surges from historical typhoons (1948–2013) that entered the Philippine Area of Responsibility (PAR) were modeled using the characteristics of TY Haiyan (Lapidez et al. 2015). Storm surge models reveal that coastal areas in the central Visayas, southern Luzon, and northeastern Mindanao are the most vulnerable to high storm surges, while the modeled storm surge heights along the west Luzon coastline range from 1 to 2 m (Lapidez et al. 2015). Prehistoric strong typhoons have also been reported to affect the west Luzon coast. Using coral lithofacies and chronology of a reef flat in La Union, the large wave event which possibly occurred 324 years BP was more likely a severe tropical cyclone event, but the occurrence of a tsunami was not completely ruled out (Gong et al. 2013). Coral and stratigraphic data collected across the SCS region further provide evidence of an extreme wave event ~1000 years ago. From transported coral blocks and lagoon sediments in the southern SCS (Yongshu Reef), Yu et al. (2009) inferred a past strong storm or tsunami in AD 1064. Sand layers in lake sediment cores from the Xisha islands also indicate a sudden and high-energy event, potentially a tsunami, in AD 1024 (Sun et al. 2013). Among the historical strong wave events recorded in the SCS region, the AD 1071 event which affected Guangdong, China closely correlates with the stratigraphic data of Yu et al. (2009), Sun et al. (2013), and our dated coral samples (e.g., 945.1 ± 4.6 years BP or AD 1043–1051; 903.1 ± 3.9 years BP or AD 1000–1010) in Badoc Island. A potentially large coseismic uplift event in the last millennium is also inferred along west Luzon based on uplifted coral microatolls in La Union. 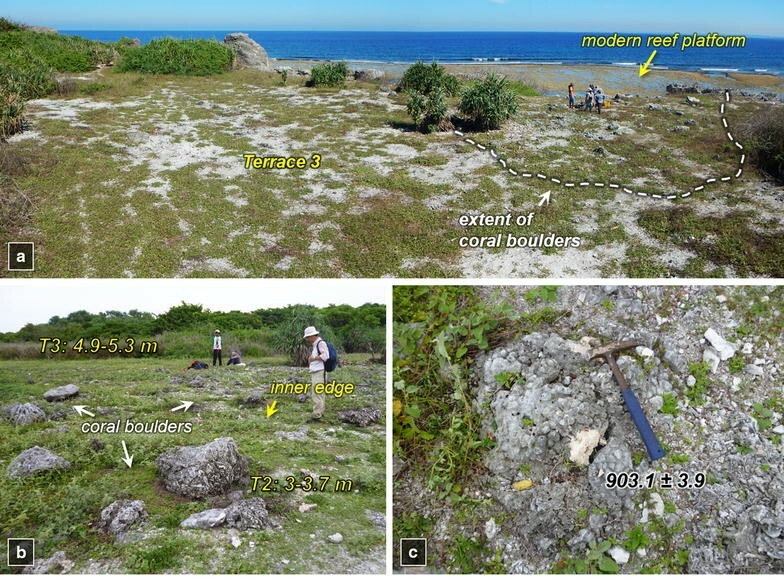 Radiocarbon and 230Th/234U dating of coral microatolls (0.8 m amsl) at Paraoir site reveal ages that range from 1.5 to 1.1 ka (Hosono 2003; Abigania 2011). However, recent analysis of historical tsunamis in written records and regional databases of the SCS region still present challenges in evaluating the validity of past tsunami events (Mak and Chan 2007; Lau et al. 2010). To evaluate the process of emplaced coral boulders onto the 5-m-high terrace in Badoc Island, we performed simple numerical models to constrain a tsunami in the region. Two hypothetical source faults along the Manila Trench megathrust- and one upper-plate fault in the northern forearc region are modeled to constrain the transport and emplacement mechanism of Late Holocene corals in Badoc Island and nearby coasts (Fig. 4). For the megathrust model, we established the length of the potential source fault from the trench azimuth from 14°N to 18°N, while focal mechanism solutions were used to infer the orientation of the upper-plate fault. Fault widths were estimated using seismicity and coastal deformation patterns as interpreted from uplifted coral terraces in west Luzon [e.g., (Ramos and Tsutsumi 2010)]. The dip angle of the megathrust- and upper-plate faults was inferred from early geophysical data (e.g., gravity, seismic reflection) across the Manila Trench forearc region (Hayes and Lewis 1984) coupled with focal mechanism solutions (Fig. 1b). We then utilized the scaling relation of Murotani et al. (2013) and Wells and Coppersmith (1994) to estimate fault slip along the hypothetical megathrust- and upper-plate fault, respectively. For the megathrust fault model, a rupture along a 440-km × 120-km fault is calculated to have almost 3.5 m of slip and will generate a Mw8.5 earthquake. Subsidence of the west Luzon coastline is expected with any amount of slip along the megathrust and may therefore potentially amplify the impacts of the tsunami. Although available coastal geomorphic data in west Luzon are currently not sufficient to infer subsidence in the region, the possibility of interseismic and postseismic subsidence is high due to the region’s active tectonic setting and exposure to subduction zone seismic cycles. 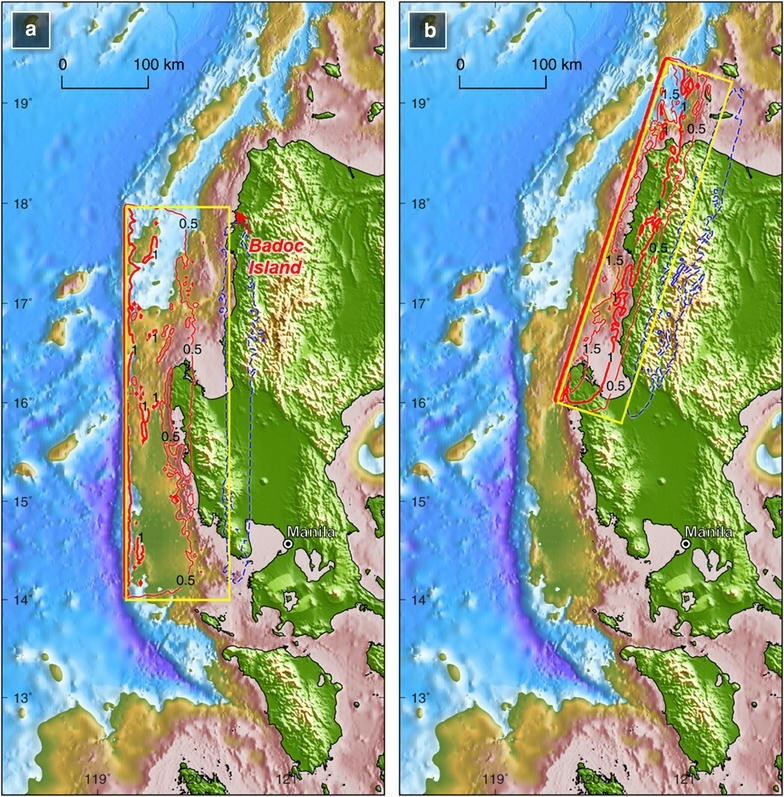 To produce permanent uplift of the west Luzon coast to expose the reef terraces, rupture along an upper-plate fault in the forearc region is modeled. The upper-plate model is a 400-km × 80-km fault plane that is calculated to have almost 5 m of slip and will generate a Mw8.4 earthquake. The calculated slip and earthquake magnitude could potentially cause uplift of the west Luzon coast by as much as 1.5–2 m. In order to produce coastal uplift of about 3 m (i.e., height of the lowest emergent terraces), a larger amount of fault slip (i.e., 10 m) on the upper-plate fault is modeled and will produce a wave height of more than 5 m along the coasts of Badoc. In both megathrust and upper-plate fault models, tsunami wave height (run-up height when wave approaches land) reaches more than 3 m high with inundation distance as far as 2 km along the coasts of Badoc (Fig. 5). It should be noted that the reported earthquake magnitudes resulting from the modeled hypothetical source fault rupture models are minimum values to generate a tsunami that will inundate Badoc Island and its mainland, and will potentially emplace coral boulders on surfaces that are a few meters high. We further emphasize that the source fault, fault slip, and tsunami inundation models presented in this study are preliminary (i.e., values assigned to assess the potential effects of tsunamis) and will be refined as more geomorphologic, stratigraphic, and geophysical data become available. While emplacement of coral boulders by an unusually strong typhoon is also likely, modeled storm surge heights along west Luzon do not exceed 2 m even with Typhoon Haiyan characteristics [e.g., (Lapidez et al. 2015)]. This study highlights the first and preliminary attempt to combine geomorphologic data and numerical models to constrain a prehistoric extreme wave event across the eastern SCS and Manila Trench forearc region. The occurrence of an extreme wave event about 1000 years ago is inferred based on the presence of young fossil corals on a ~5 m-high emergent coral platform in Badoc Island offshore west Luzon. The characteristics and distribution of ~1-ka-old coral boulders in Badoc Island and Badoc mainland suggest high-energy deposition and emplacement by overwash. We used uplifted reef platforms to infer meter-scale coseismic uplift following a significantly large offshore earthquake that is also potentially tsunamigenic. Using scaling relations, preliminary seismotectonic models show that reverse slip of 5 m along a 400-km × 80-km upper-plate fault on the northern forearc region of the Manila Trench will generate a Mw8.4 earthquake and uplift of the west Luzon coastline by a few meters. To produce coastal uplift that will raise the lowest terraces to their present elevation, a larger amount of slip (10 m) is modeled. Meanwhile, a Mw8.5 megathrust earthquake along the Manila Trench on a 440-km × 120-km fault plane with pure reverse slip of 3.5 m is shown to cause subsidence of the west Luzon coastline and possibly increases the damage of wave inundation. Both source faults will lead to a tsunami wave height of more than 3 m and inundation distance as far as 2 km along the coasts of western and northern Luzon. While an unusually strong typhoon could also explain the overwash deposits, storm surge heights modeled for the west Luzon coastline do not exceed 2 m even with the characteristics of Typhoon Haiyan. 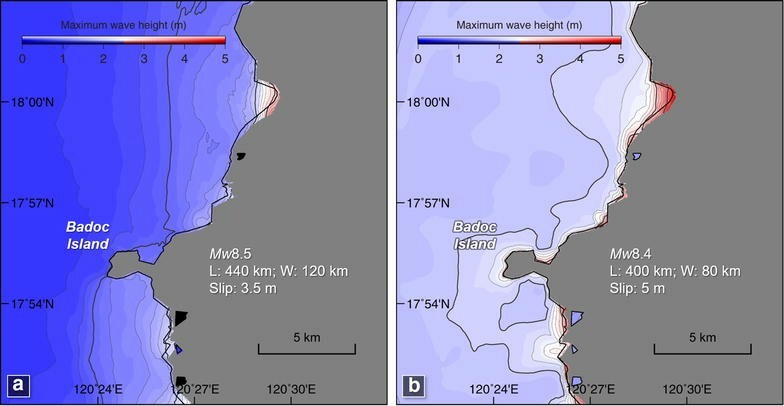 Although preliminary, the tsunami hypothesis is supported by rupture and inundation models (e.g., wave height) to account for the emplacement of coral boulders on an uplifted reef in Badoc Island. Future modeling of storm surges along the west Luzon coasts is recommended to further test the strong typhoon scenario. More importantly, this study highlights the vulnerability of coastal communities in west Luzon and surrounding cities across the SCS region to coastal hazards brought about by tsunamis and strong typhoons. By modeling past extreme wave events, we are able to assess the impacts of potentially similar events in the future and allow communities to prepare for worst case scenarios. NTR designed the study and led the writing of the manuscript, with inputs from KVM, HT, CCS and KS. NTR, KVM, and HT participated in the field surveys, data gathering, and interpretation of geomorphic data. CCS, KVM, YCC, and FD processed and measured 230Th ages of coral samples. NTR and KS performed the tsunami modeling, while KVM performed initial modeling of storm surge heights. All authors read and approved the final manuscript. N. Ramos acknowledges the financial support of the Japan International Cooperation Agency Project Office for ASEAN University Network/Southeast Asia Engineering Education Development Network (JICA AUN/SEED-Net) through its Collaborative Research Program for Alumni Members (Project No. UP CRA1401). The authors are thankful to Hsun-Ming Hu of HISPEC Laboratory at the National Taiwan University for his assistance in 230Th dating of coral samples. N. Ramos performed the tsunami modeling and utilized the Earthquake Information Center (EIC) computer system through funding support from the Earthquake Research Institute (ERI), the University of Tokyo; A. Gusman, T. Ho, and M. Uehara are thanked for their scientific inputs and technical assistance. Field assistance was provided by L.F. Sarmiento, R.B. Mendoza, L.G. de Guia, and students of the GEAR (Geomorphology, Earthquakes, and Active Tectonics Research) and RWG (Rusurgent Working Group) laboratories at UP-NIGS. The Philippine Institute of Volcanology and Seismology (PHIVOLCS) and the National Mapping and Resource Information Authority (NAMRIA) are thanked for their provision of earthquake and high-resolution topographic data, respectively. The Mines and Geosciences Bureau (MGB) also provided support through provision of necessary permits for the samples. The authors also thank the local government officials of Ilocos Norte Province for their cooperation and logistical support; K.M. Cabacaba, J. Abat, and J.K. Suarez for their assistance in testing the hypothetical storm surge model through Delft 3D. The authors are grateful to the editor and three anonymous reviewers for their inputs that greatly improved the manuscript. Sections of this paper were presented at the 13th Annual Meeting of the Asia Oceania Geosciences Society in China, 35th International Geological Congress in South Africa, and 1st Meeting of the International Geoscience Programme (IGCP) Project 639 in Oman with travel support from the University of the Philippines Office of the Vice President for Academic Affairs (UP OVPAA) and IGCP. This paper is a contribution to IGCP Project 639: Sea Level Change from Minutes to Millennia. This research was supported by the Japan International Cooperation Agency Project Office for ASEAN University Network/Southeast Asia Engineering Education Development Network (JICA AUN/SEED-Net) through its Collaborative Research Program for Alumni Members (Project No. UP CRA 1401). U-Th dating at the HISPEC was supported by Taiwan ROC-MOST and NTU Grants (104-2119-M-002-003, 105-2119-M-002-001, and 105R7625 to CCS). The Earthquake Research Institute, the University of Tokyo supported the research activities of N. Ramos in Japan through its research fellowship program.